4 ways to sleep, work or be alone when you’re stuck at the airport. 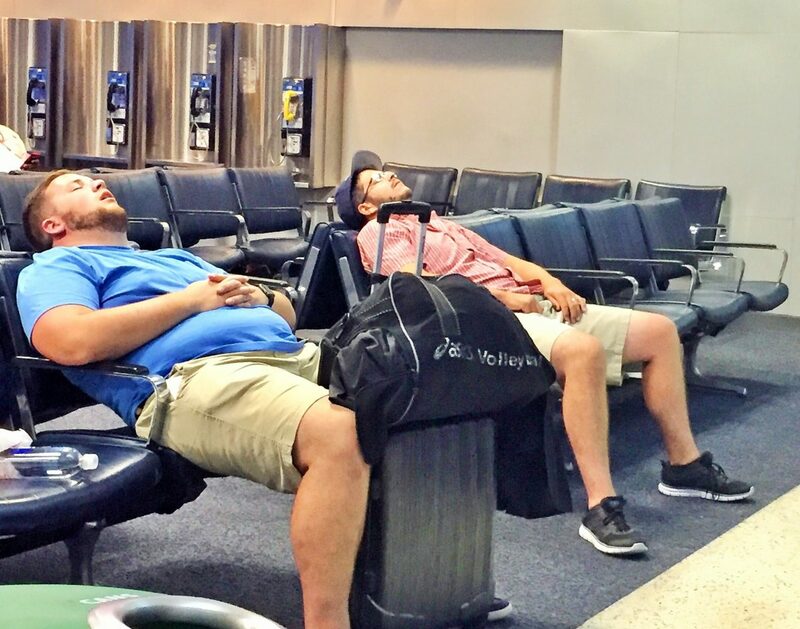 My column for CNBC this week is a round-up of options for finding a place outside airport lounges to sleep, have a quiet conversation or just have a little quiet time to yourself. Business travelers once looked to airline club rooms as calm oases offering quiet areas to relax, work, conduct important phone calls or, perhaps, catch a nap. But now it’s not unusual for airline-operated and independent lounges to be as crowded and noisy as the congested airport terminals and gate hold areas many frequent travelers are willing to pay a fee to avoid. Outside the United States, travelers seeking alone time might check into one of the Napcabs equipped with beds, worktables, touch screens, WiFi and baggage storage inside Germany’s Munich or Berlin-Tegel Airports. Elsewhere, Yotel offers cozy, cabin-like hotel rooms equipped with futon-like beds, WIFI, flat screen TVS and bathrooms inside airport terminals in Amsterdam, London (Heathrow and Gatwick), Paris CDG and, soon, Istanbul and Singapore. In the United States, travelers seeking sleep, a place to work or a quiet place to have a phone conversation have an increasing range of options. Boston-based Sleepbox plans to cut the ribbon on a post-security micro-hotel on Concourse A at Dulles International Airport next week. Pricing: Average hourly rate for compact rooms (about 30 square feet) is $25 per hour. Standard rooms (45 square feet): $35 per hour. After the first hour, additional 15-minute increments are $5 for the compact room, $7.50 for the standard-room. Rates top out at $120 for a 12-hour stay in a compact room and $140 for 12-hours in a standard room. Minute Suites is a short-stay hotel chain with six post-security locations in four airports: two in Atlanta’s Hartsfield-Jackson International Airport (Concourses B&T); two in Dallas-Fort Worth International Airport (Terminals A&D), one in the Charlotte Douglas International Airport atrium and one in the A/B Connector at Philadelphia International Airport. The basic 56-square-foot suites have sofa daybeds with a pull-out trundle beds, sound-masking systems, HDTVs (with DirectTV and Netflix) that can also be used as computers, WIFI, and desks. A few suites in the DFW location are larger. The company is adding four additional locations in ATL airport, a second location in Charlotte and has just announced Baltimore/Washington International Airport (BWI) as its next city. Plans to open branches in four additional airports are being finalized now. An uptick in the number of millennial travelers is helping drive Minute Suites’ expansion. Rates for Minutes Suites start at $42 per hour and drop to $32 per hour after two hours. The overnight rate (8 hours) is a flat $155. Showers (available in DFW Terminal D) and Charlotte Douglas International Airport are $20, with suite rental; $30 without. Phone-booth sized workspaces from Jabbrrbox, offering travelers private, quiet places to work and make phone calls, are available at New York’s LaGuardia Airport Terminal B, Pittsburgh International Airport (Concourse B and C) and on Concourse B at Cincinnati-Northern Kentucky International Airport (CVG). Two new booths were installed in New York’s John F. Kennedy International Airport Terminal 4 this week. Users make reservations using touchscreens on the exterior of each unit and, once inside, will find WIFI, a desk, chair, power panel and another, larger, touchscreen that is used to control the color and brightness of the booth lights, track flight status and take photos. Jabbrrbox pricing is $10 for 15 minutes, $15 for 30 minutes, $30 for an hour and $60 for two hours. Business travelers who need to work but who also want to stretch their legs before or between flights can do both at the complimentary Varidesk co-working space at Dallas-Fort Worth International Airport. Opened in December and located in Terminal C, the staffed workspace has about two dozen height-adjustable standing desks, 75 charging ports and a conference room with moveable walls. Varidesk chief marketing officer, Sean Scogin, says the company plans to open co-working spaces at other airports soon and may add its new state-of-the-art phone booth to the mix. Have you found a good way to get out of the fray when you’re stuck at the airport? Share a tip below. I’ve got a full review of the new Terminal 2 at Seoul’s Incheon Airport up on the Today in the Sky blog at USA TODAY, but sharing some more snaps from my visit here. The terminal officially opened on January 18 – just a few weeks before 2018 PyeongChang Winter Olympic Games- and it’s a keeper. 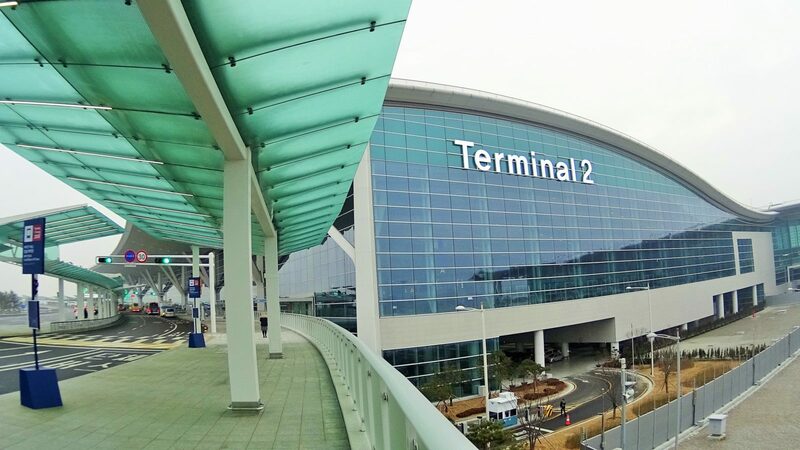 Four airlines will use the terminal: South Korea’s flag carrier Korean Air, Delta Air Lines, Air France and KLM Royal Dutch Airlines. Photovoltaic panels on the roof and natural greenery inside the terminal help keep the air fresh and lower heating and ventilation costs. A fleet of robots help passengers find their way. Korean music and cultural performances are offered throughout the day and two Korean Traditional Cultural Experience Centers offer passengers the opportunity to try their hands at a Korean craft. Beyond shopping and eating, there are activities to keep travelers entertained, including a large Kids Zone, the IT Experience Zone with VR soccer and flying (plus a coffee-making robot) and, in the transfer zone, a ‘digital gym’ that encourages jumping, stepping and other activites. There’s also plenty of art and an observation deck with a cafe, views of the airfield and exhibits about the airport. I snapped this picture on the run a few weeks ago at George Bush Intercontinental Airport. I don’t know these guys, but see travelers like them everywhere. And I wish them, any anyone else ever stuck at the airport, a pleasant trip. My “At the Airport” column in USA for July 2017 was mostly about a new company hoping to bring relief for travelers stuck at the airport with an easy to install napping pod. I’m posting a slightly different version of that column here on Stuck at the Airport in case you missed it. Airports and the passenger experience may soon change thanks to everything from biometrics, robots and customer data mining to augmented reality, ride-sharing, autonomous transportation and new screening technologies. All that – an more – was on the agenda recently at a gathering of industry leaders that included airport employees with the word “innovation” in their job titles. The Airport Innovation Forum, organized by the American Association of Airport Executives, capped off with a Shark Tank-style competition in which five startups competed for a spot in the Airport Market Match program. I was part of a panel of judges that included innovation experts from Microsoft and Amazon and an aviation industry insider. And while we grilled the contestants for details on their business plans, it was up to forum attendees using an instant electronic polling system to choose the winners. Competing ideas included an app designed to help visually impaired travelers navigate airports (Loud Steps), a mobile app to monetize passenger loyalty (Venuetize), and a platform that analyzes mobile device location data for insights on passenger behavior (Kiana Analytics). But the two (tied) winners were Bellevue, WA-based Alitheon, a company whose proprietary computer technology can very accurately and security authenticate, track, trace and monitor baggage without the need for barcodes, tags or RFID chips, and the passenger-friendly “sleep vending machines” created by Boston-based Sleepbox. Airport operators and security teams will be most interested in the services of contest winner Alitheon, but being able grab a bit of shut-eye when you’re stuck at the airport ranks high on most every traveler’s wish list. The self-contained, plug-in Sleepbox units are just that: efficiently-designed 45-square foot boxes with a window to the outside and, inside, a bed, storage space for carry-on luggage, a wireless stereo system, fold down work table, wall mirror, lighting and electrical outlets. Units come in three sizes: basic (“InnerSpace”), single or double. The original design called for the united to have self-changing sheets, with a new set-up unwinding from a bed-linen roll after each use. And while Chambers still likes that idea, the current design has an attendant doing clean-up duty. Positive reaction and a flurry of “We need this now!” press coverage in response to a prototype Sleepbox set up for three months in 2011 at Sheremetyevo International Airport in Moscow, Russia and success with a hotel-use set-up in Stockholm convinced the creators they had a good idea. Of course, they aren’t the first to have this idea. Road warriors may remember Laptop Lane from the late 1990s. The company rented fully-equipped private mini-offices with desks, computers, Wi-Fi, walls and locking doors in, eventually, about two dozen airports nationwide. While these units didn’t have beds, they were often rented by travelers who needed a place to nap. For a short time around 2004, stylish sleep pod chairs from Metro Naps, with special sleep music and a gentle wake-up program of lights and vibrations, were available to weary travelers at Vancouver International Airport. Prices and stay requirements vary for each style of napping nook, but today travelers will find sleeping cabins by NapCabs in both Munich Airport and Berlin-Tegel Airport in Germany, GoSleep sleeping pods in the Abu Dhabi and Dubai airports and Minute Suites – equipped with daybed sofas, HDTV (that can be used as a computer) and work tables – in Philadelphia International Airport, Dallas-Fort Worth International Airport and in Hartsfield-Jackson Atlanta International Airport. The Yotel hotel chain also offers airport sleeping cabins with beds, work spaces, TV and private bathrooms (with showers) in London’s Heathrow and Gatwick Airports, in Paris Charles de Gaulle Airport and in Amsterdam Schiphol Airport. 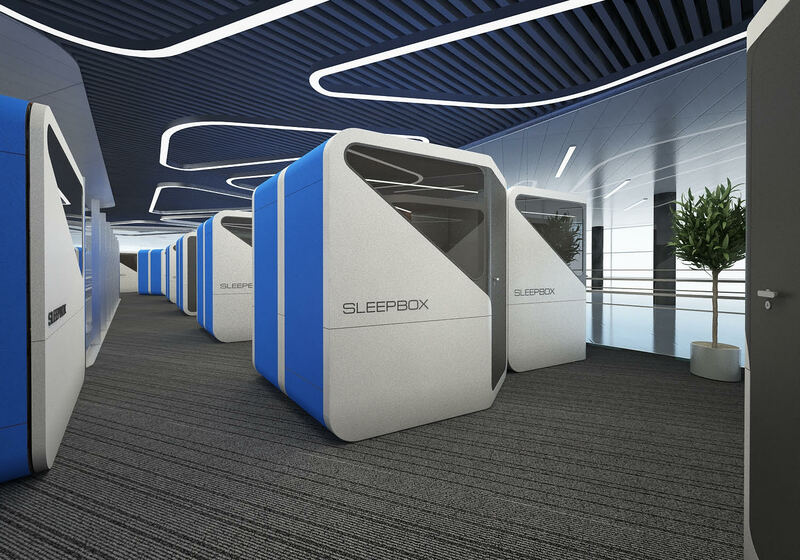 Chambers believes there’s room for the Sleepbox concept in the airport (and hotel) napping market in the United States and says the company currently recently presented its proposal to install a bevy of Sleepbox units (10 to 20) in a former airport lounge at a major US hub. Airport amenity of the week? 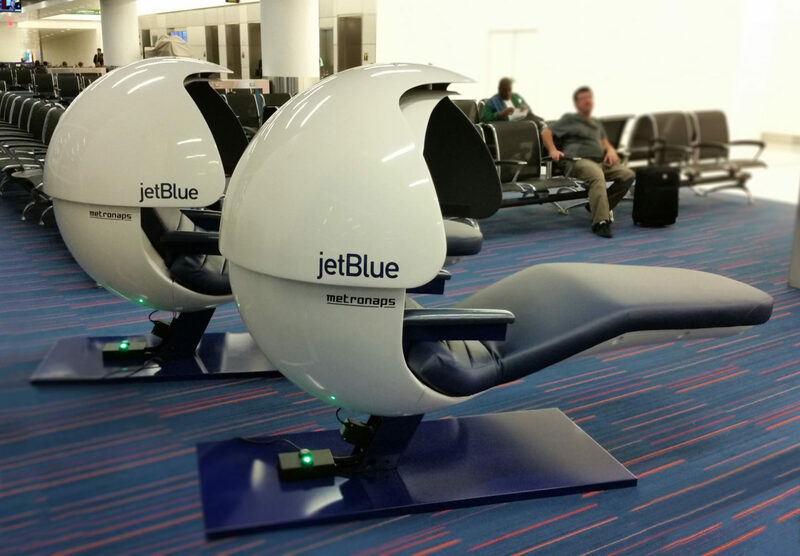 NYC-based JetBlue Airways has teamed up with MetroNaps to bring free napping pods to JetBlue’s Terminal 5 at John F. Kennedy International Airport. Four MetroNaps Energy Pods were unveiled Tuesday and offer travelers complimentary 20-minute “JetNaps” on a first-come, first served basis. MetroNaps says their pods offer “an ergonomically perfect, gravity-neutral position that optimizes circulation and encourages a reinvigorating, restful siesta” with visors for “serene seclusion” and soothing sounds piped in to block out noise. There are even storage bins for tucking away carry-on bags and coats. These are napping pods – not sleeping pods – so after the 20 complimentary minutes the pod will wake you up. Not by shaking you and yelling “Hey, you – get outta’ here!” but by raising up out of a recline position and gently waking you with a combination of lights, music and vibration. Just don’t let the bed bugs bite..